Several previous works form the foundation that this article is built on. To understand the absolute accuracy of this presentation the articles must be read to fill in vital information. They prove God’s method of tracking time. The articles can be found at the web site: www.biblicalcalendarproof.com and are titled: PROOF OF THE CALENDAR GENERATOR, NOAH’S FLOOD AND GOD’S CALENDAR, HAS THE PASSOVER BEEN PASSED OVER, SOLOMON’S TEMPLE DEDECIATED ON THE JUBILEE, THE DESTRUCTION OF SOLOMON’S TEMPLE DATED and THE GOOD FRIDAY MYTH. These articles should be read at the point where they are presented in this work. Only one of the thirteen periods that make up the Metonic cycle has a starting day that reflects the first day of the seven day creation week. That day is called Sunday, and of course it complies with Genesis 1:3-5. “Then God said, ‘Let there be light, and there was light. And God saw the light that it was good; and God divided the light from the darkness. He called the light day, and the darkness He called night. So the evening and the morning were the first day. This was day one of the seven days of creation. The following chart gives the first segment of time from creation to the flood. (See article: NOAH’S FLOOD AND GOD’S CALENDAR.) The year of the flood would be 1656 + 5 = 1661. This is the first year that has a 385 day length that followed the minimum year 1656, making BC 2386 the year of the flood. 144 Years of slavery in Egypt. These 144 years of slavery assume that it started at Joseph’s death. Based on this the following observations can be made. The Israelites came out of slavery at the 430th year when Moses was 80 years old. Moses died at 120 years of age; (Deut.34:7), so subtracting 40 years of wandering would make Moses 80. 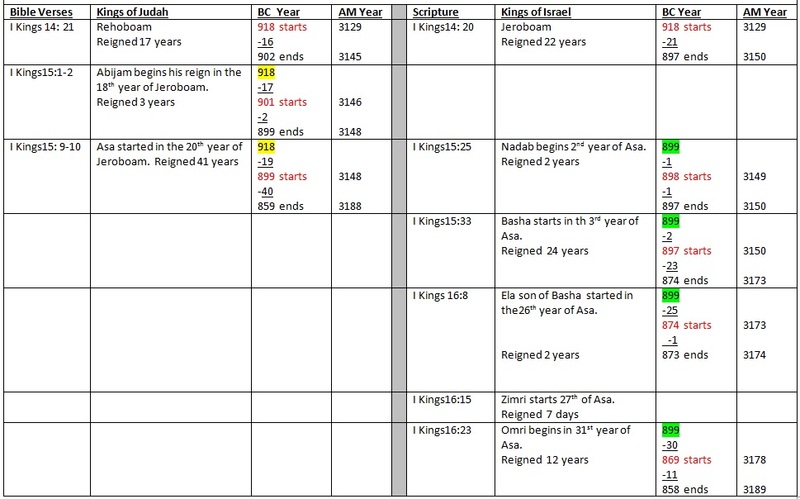 Figuring back from 430 years, minus Moses’ age of 80 at the time of the Exodus gives his birth year, which was 350 years after the original promise given to Abraham. The 350 years minus the 286 years to Joseph’s death leaves 64 years meaning Moses was born 64 years after Joseph died. This can be tied together when realizing that Moses’ mother was the daughter of Levi. Amram married Jochebed, his father’s sister. Exodus 6:20. “Now Amram took for himself Jochebed, his father’s sister, as wife;…..” It clearly shows that Jochebed was the daughter of Levi. In Numbers 1:1 God alerts us to this day being the first day of the second month, in the second year. Moses is addressed by God, marking it as a Sabbath day as shown in the article on the Passover. In the year of the exodus the same day of the second month was also a Sabbath. In Exodus 16:1 God calls out the day as the fifteenth day of the second month – a Sabbath; meaning the preceding Sabbath was on the 8th, placing the next Sabbath on the first day of the second month. This phenomenon of two years having the same rotation of weekly Sabbaths for the first six months of each year occurs seldom in God’s calendar. 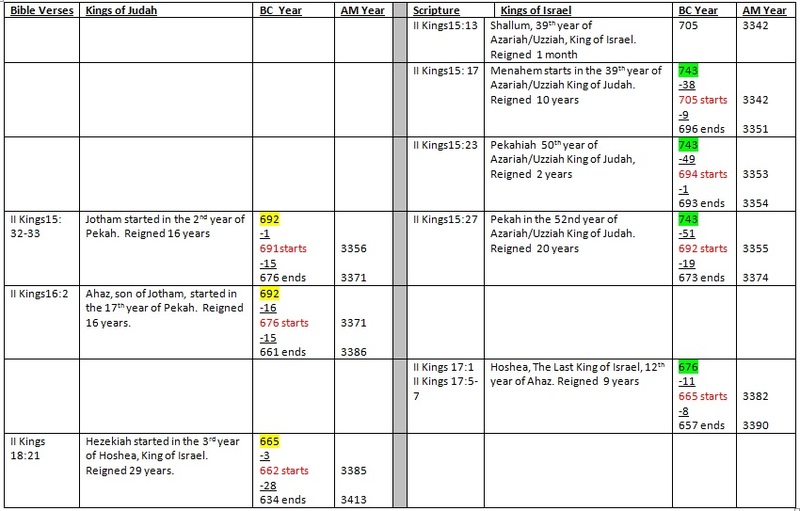 Looking at 2519 AM – 1528 BC, the year of the exodus, and 2520 AM – 1527 BC. Here we find that there are two years that have the same rotation of weekly Sabbaths for the first six months. This sequence will not happen for another 44 years. The math thus places the exodus at 2519 AM – 1528 BC. See the Calendar Generator for confirmation for these two years. 69 weeks of years x 7 = 483 years - the time from the declaration to rebuild Jerusalem to the crucifixion of Christ in 30AD. It has been established that the death of Herod, the Herod who ruled Judea at the time of Christ’s birth, was in 4 B.C., (Wikipedia placed Herod the Great’s reign at 37 B.C. to 4 B.C.) placing the birth of Christ in 5 B.C., and would move the crucifixion to an earlier date than that of 31 A.D. Having established His birth in 5 B.C., the start of His ministry would have been in the fall of 26 A.D. because Luke 3:23 tells us, “Now Jesus Himself began His ministry at about 30 years of age…” 30 A.D. has been confirmed historically by five witnesses as reaffirmed by the following information from Alfred Edersheim, the respected scholar in his book, The Life and Times of Jesus the Messiah, showing that His crucifixion was at the beginning of 30A.D. The year of the proclamation, 454 B.C., was followed by a year and four months before the actual work began, correlating with the destruction of the temple as already has been noted, making 453 B.C. the actual year of the beginning of the work of the restoration of Jerusalem. Calculating the destruction year of Jerusalem and the first temple comes about by adding the 70 years that Jerusalem should be desolate. It must be added because B.C. years are in descending order, therefore the date is 523 B.C. 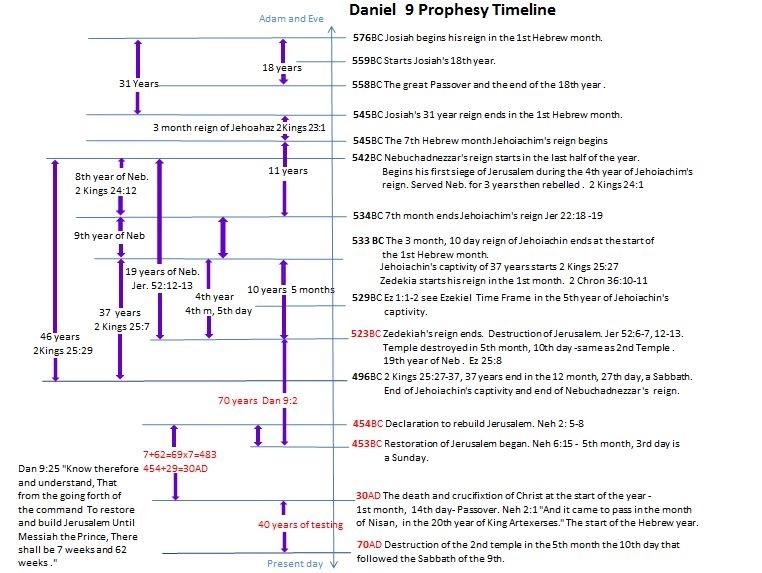 The following written explanation will be more easily understood by consulting the Daniel 9 Prophecy timeline shown here. 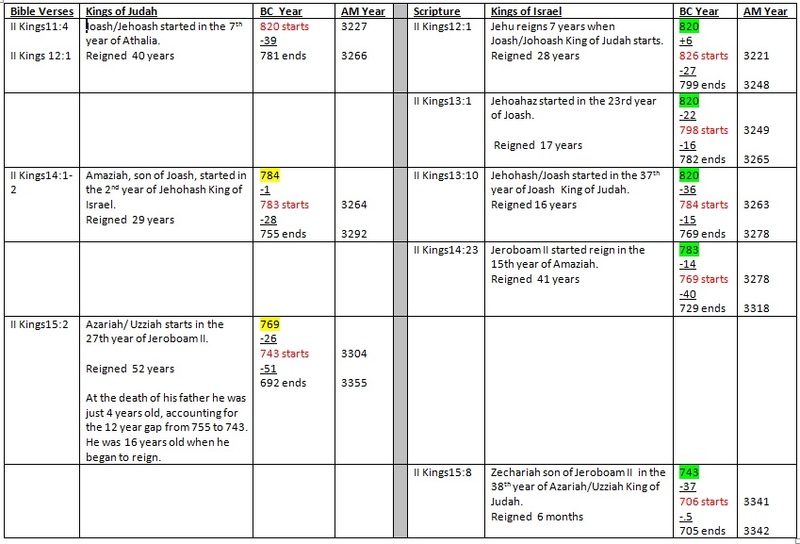 This timeline begins in 70 AD and shows the progression of years to the start of Josiah’s reign. The biblical documentation of time from creation to the beginning of David’s reign is 3,048 years. He reigned 40 years, and Solomon reigned 40 years. 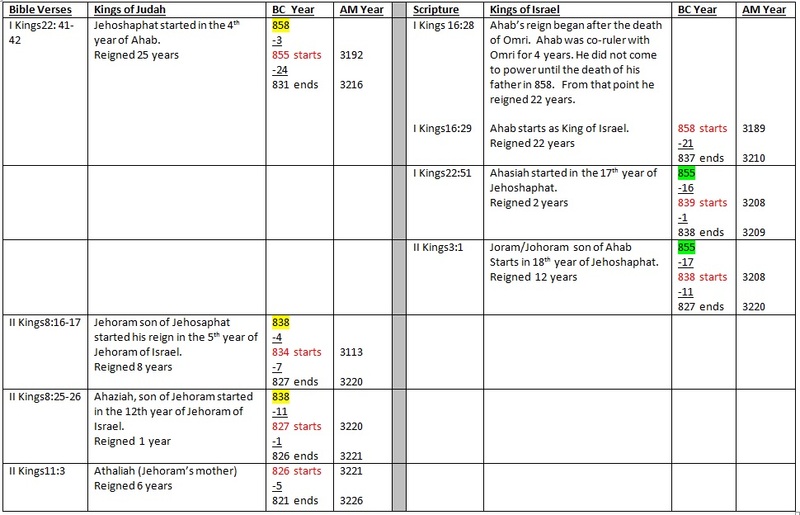 The total of 3,048 plus 80 years equals 918 BC which is the end of Solomon’s reign.